To 'make it' in Hollywood, young actors used to kick-start their careers in television, sharpening their skills and earning notoriety (and maybe an Emmy or two) before frolicking in the greener grass of feature films. Today, with the growing budgets, themes, and imaginations of series TV, episodes have almost become mini movies, inspiring a newer generation of stars to not only gravitate toward television, but maybe even stay there — even as their careers take off. Alison Brie and Gillian Jacobs epitomize this trend, two actresses who earned their comedy stripes on NBC's Community, a place where dreamatoriums come to life and paintball wars are aplenty. Meanwhile, the pair is also on the Tribeca Film Festival circuit this year — Jacobs with the dark indie comedy Revenge for Jolly! and Brie with tonight's Tribeca opener, the buzzy hit-in-waiting The Five-Year Engagement. 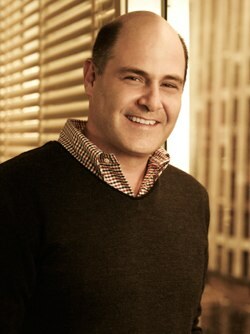 This just in at ML HQ: Esteemed Mad Men creator and occasional director Matthew Weiner will make his feature filmmaking debut with You Are Here, to co-star Owen Wilson and Zach Galifianakis in a "funny, charming, and deeply honest film about who we were, who we are, and discovering the power to embrace life, no matter how much you screw it up." There is also a road trip! And possibly Amy Poehler! Read on for full details from producer Gilbert Films.